Over recent weeks there has been a great deal of public debate surrounding the Swindon Museum and Art Gallery proposal and how this project relates to other local heritage and cultural issues, particularly the Mechanics’ Institution. Based on a review of recent discussions we have put together a list of the most frequent questions and concerns. 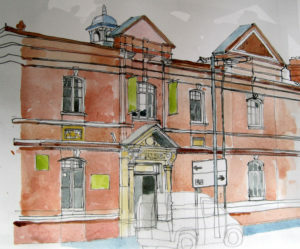 The Mechanics’ Institution Trust was set up 22 years ago on the back of a large public campaign to save the Mechanics’ Institution, and put it back into use for the local community. The Trust acquired 1,400 members in its first year, which grew to 2,500 the following year. As a registered Building Preservation Trust and a Development Trust our interest is not only in preserving heritage buildings, but ensuring they are developed for – and made accessible to – the local community, in the widest sense possible. Just as the original Mechanics’ Institution (which was itself an organisation before it was a building) was focused on the wider community and not just its own premises, our focus has always been on the wider Railway Village Conservation Area – paying attention to the needs of those who live in the immediate area as well as those of the wider town. This is why, over the years whilst progress on the Mechanics’ was proving slow, we have turned our attention and efforts to other empty or underutilised premises in the local area. The first of these was the old Railway Museum (now called ‘The Platform’) which we successfully ran as a community cultural centre (then titled ‘Community Crossroads’) for over 6 years, as a viable social enterprise. All of the costs needed to run the building were either earnt through hiring the space out for events or were donated to us by supporters and legacies. Many new activities took place here during this time, including art exhibitions by local artists, community and cultural events and a vast amount of activity focused primarily on young people including arts and circus workshops, dance classes and more. We have also helped to bring in significant funding for improvements to the GWR Park on Faringdon Road and have run several Children’s Fete’s there, all of which have helped turn the park around from a negative space to a much more positive, safe and well-used one. More recently, we have taken over management of the Central Community Centre in Emlyn Square, which in the past 3 years has grown dramatically in use and has been made much more accessible and welcoming to local people, as well as being turned from a profit-loss into a thriving social business. During this time, we have also run a programme of community development activity focused on tackling health inequality and providing activities for those living in the immediate neighborhoods, funded by the People’s Health Lottery. We have also been working towards opening a new Community Café in the disused Bakers Arms pub which has recently been awarded funding for renovation. Our view is that all of the buildings in this area, and in the wider town, need to complement and support each other and not be conflicting or competing in their uses, in order for Swindon to have what it needs and wants. We seek ‘the best things, in the right places’. This is why our focus has always been wider than the Mechanics’ itself and why we have held a longstanding proposal (for at least 10 years) for a new Art Gallery & Museum to be housed in the Carriage Works along London Street when the opportunity arose. Does the Mechanics’ Institution Trust propose that the Swindon Museum & Art Gallery should be relocated to the Mechanics’ Institution? What is the relationship between the petition promoting the Carriage Works location and the Mechanics’ Trust? Would locating the Museum and Art Gallery undermine or compete with the proposals by Forward Swindon (FSL) for the Carriage Works? Why wasn’t the Carriage Works considered in the first place? Can both the Mechanics’ and SMAG access HLF funding? What was discussed when the Trust met with the HLF? Is the Mechanics’ Trust concerned that the SMAG proposal would undermine the viability of the Mechanics’? What does the Mechanics’ Trust want to see happen next? 1) Does the Mechanics’ Institution Trust believe that the Swindon Museum & Art Gallery should be relocated to the Mechanics’ Institution? a) No – we never have believed or proposed this, but this is a common misunderstanding. It is not the view of the Mechanics’ Trust that the Swindon Museum & Art Gallery should be rehoused in the Mechanics’. We believe that the Mechanics’ is not suited to an art gallery / museum space (the Options Appraisal which SBC undertook also held this view), nor do we believe this would be the best use of the building. We want to see the Mechanics’ restored to, as much as possible, its original uses within a 21st Century model. 2) What is the relationship between the petition promoting the Carriage Works location and the Mechanics’ Trust? a) The petition was started by an independent member of the public who has no relationship with the Trust. We only met this individual at the meeting recently convened by Robert Buckland MP which brought interested parties together. We also have no prior relationship with the people who set up and administrate the Save Swindon’s Heritage Facebook group. a) As outlined above, the Mechanics’ Trust (as a Building Preservation and Development Trust) has always had an interest in the wider Railway Village Conservation Area. We have had a longstanding (10 year) view that that Carriage Works would make an excellent new home for the Swindon Museum & Art Gallery. We do not own the building, nor do we need to, as we have never proposed to take this project on ourselves – but would like to see this project working in conjunction and collaboration with the Mechanics’ and the wider town. b) It needs to be investigated fully whether the creation of the Museum and Art Gallery in the Carriage Works could be achieved with a budget using the £5 million commitment from SBC, the £1.3 million from the LEP and the c.£5 million from private donors. Therefore a c.£10-11 million budget needs to be assessed. 4) Would locating the Museum and Art Gallery undermine or compete with the proposals by Forward Swindon (FSL) for the Carriage Works? a) We believe a Museum and Art Gallery is complementary to the proposal by FSL for office accommodation and they are about to implement just phase one in a relatively small part of this extensive site (Unit 3 and 5). Therefore, nothing concerning the current project would prevent SMAG co-locating there in the future. 5) Why wasn’t the Carriage Works considered in the first place? a) In 2013 the Council embarked on a Leisure and Culture Review with the objective of significantly reducing the budget for Leisure and Cultural services in the town. This process included the eventual transfer of Leisure facilities to a new operator and the more recent process surrounding Lydiard for example. In terms of museums and collections the original report proposed investigating options to close the Bath Road premises and/or relocate the collections to say STEAM or Lydiard. However, such an extreme approach was later dropped. c) It is worth noting that SBC are currently saying the Carriage Works could not have been included because they didn’t own it however given that two of the four sites above were also not owned by SBC it seems to make that a rather redundant argument. d) Linked to the above is the fact the Carriage Works site is very shortly due to transfer in ownership from Network Rail to SBC following a land swap deal. e) The Trust made representations to SBC before, during and after the Leisure and Culture Review process to ask that the Carriage Works be included in the options appraisal. We also made some suggestions of other ‘meanwhile’ sites in the Railway Works Conservation Area near STEAM that could at least temporarily house and expand the collection. These requests were not taken on board and no reasons were given why not. f) We continued to lobby SBC of the merits of the considering the Carriage Works as a location. 6) Can both the Mechanics’ and SMAG access HLF funding? a) The Museum and Art Gallery Trust proposal was agreed to go forward to the HLF in December 2016 however the Trust decided that they weren’t ready. It was decided outside of the Swindon Heritage Board that they would proceed to December 2017 instead and this was announced publicly. b) The Mechanics’ viability study had set out that the Mechanics’ could potentially be ready for submission in December 2017, but once the Museum and Art Gallery Trust had announced they would be submitting a year later than proposed and the fact that discussions with SBC were slow, then meant in effect the Mechanics’ stood no chance of submitting in 2017 and would need to wait until December 2018.
c) Both projects would be seeking a national level grant of c.£10-12 million from the HLF and the Mechanics’ Trust therefore asked HLF whether it was likely that they would fund two large grants two years in a row to the same town. Their formal answer was that they would assess each application on its merits alongside bids from across the country. Officially it is possible therefore for both bids, one in 2017 and one in 2018, to be submitted. It is not known how two large scale bids two years in a row for the same town would be viewed less formally by the grant committee. 7) What was discussed when the Trust met with the HLF? a) The Trust met with the HLF Head of South West Region in November 2016. The purpose of this meeting was to share the recent Mechanics’ Institution Viability Report and discuss our wider work programme. 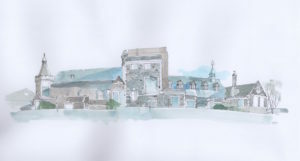 b) The report was welcomed by HLF who confirmed their desire to see the building restored and that working towards a national Main Grant Round One application was encouraged. c) The Trust also set out our wider work programme in the meeting including our vision for the regeneration of the Railway Village more broadly, to set the Mechanics’ in its historic context. Again this was met with interest. d) Subsequently the HLF wrote to SBC encouraging them to work with the Trust and provide a letter of support which would unlock the next phase of viability funding in order to be ready for a Round One application in November 2018. 8) Is the Mechanics’ Trust concerned that the Museum and Art Gallery proposal would undermine the viability of the Mechanics’? a) The Museum and Art Gallery proposal has been described as creating a community and cultural heart and centre for Swindon. This is exactly the same ethos the Mechanics’ Trust has identified for the Mechanics’ Institution over many years and which is core to the recent Viability Report. A report that can at last be realized and deliver a restored Mechanics’ Institution. b) More specifically the current proposed Museum and Art Gallery has been described to include uses which would directly undermine and compete with the Mechanics’ uses identified in the Viability Report, such as meeting and conference space, performance space, and community spaces. Such uses are at the heart of the historic significance of the Mechanics’ and indeed a 21st Century version of such uses has long been identified as being core to financial and social viability of the Mechanics’. c) Two venues providing both the same ethos and uses to a very similar audience cannot be sustained in the local Swindon market. The Mechanics’ plans have been waiting to move forward for so many years and are now at last viable with the building no longer in private ownership. The fact that the Mechanics’ is a Building at Risk (as designated by Historic England) shows the need to protect the Mechanics’ as Swindon’s top priority when it comes to heritage and culture. The Mechanics’ has a sense of urgency that the collection (as important as it is) does not have. d) In support of this view the Swindon Heritage Board Strategy Consultation showed the Mechanics’ as the number one priority for Swindon people to have resolved. 9) What does the Mechanics’ Trust want to see happen next? a) The Mechanics’ Trust has always been keen to work in partnership and collaboration with Swindon Borough Council, as well as with other community and heritage groups – and this remains our wish. We want to move forward together in a cooperative manner that takes into account the needs of both projects and organisations but also, importantly, the wishes of local people. b) The Mechanics’ Trust has been asking for a Letter of Support from SBC since January 2017, which will enable us to unlock funds to take the restoration of the Mechanics’ to the next phase. We feel there would be no better sign of the Council also wanting to work together for the good of the town than for this letter to be provided, and we would like this by the end of May. ‘A hive of community, culture, learning and creativity’ – you could be forgiven for assuming such a headline is straight out of modern marketing spin for regeneration. But actually this description is about something that all started 175 years ago, namely the highly innovative and far-reaching work of Swindon’s Mechanics’ Institution. Even before the Institution built its premises in 1854 the organisation was rising to the social, health, learning and cultural challenges of the day. like the Medical Fund Society were created to meet the challenge of Swindon’s health needs and later built the Milton Road Baths in 1891. The early success of technical education led to the building of the Technical College on Victoria Hill. Swindon’s new museum and art gallery makes you wonder how a gaping hole by the Wyvern has managed to get ahead of a 30-year community effort to re-claim the derelict Mechanics’ Institution for the people of Swindon. Swindon Borough Council decided some time ago to create a ‘cultural quarter’ in and around the proposed site of this new museum and art gallery. This happened with little public consultation, if any. What has been ignored is the potential of Railway Village area to once again be Swindon’s true ‘cultural quarter.’ Interestingly an idea supported by the very consultants that were appointed to create the Town Centre Masterplan by the Council – although that recommendation somehow disappeared by the time the Masterplan was published by the Council. Earlier I mentioned marketing spin – Swindon is immensely lucky that we have such a legacy of a ‘cultural quarter’ just waiting to be dusted off and brought back to life. We all want to see excellent culture and heritage in Swindon but let it be authentic and grounded in our sense of place. Swindon has an impressive modern art collection hidden away in Old Town in a building erected purposely in the 1960’s. And it might be better displayed in the town centre, in a larger building. But is this the right place? Who has decided, and by what process, that this is so important, now? Pursuing this goal now set about by Swindon Borough Council without co-ordination, prioritisation and strategy of the Swindon Heritage Board has undermined the opportunities and long held aspirations of many local people. 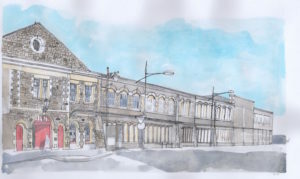 The Council has committed £5 million borrowing towards the project in the hope of c.£10 million Heritage Lottery funding, when the Mechanics’ Trust has long expected this very same Lottery Fund to support the renovation and re-use of Swindon’s most significant heritage at risk building. The Council has been fully aware of this yet failed to understand the potential to undermine both projects. If the goal of a new museum and art gallery is to make our collections more accessible and celebrated, then an alternative vision that truly has heart and soul, is required. Imagine a restored Railway Village, once again the centre of Swindon’s social and cultural life, with the Mechanics’ Institution at its core providing a facility for community action, large events spaces, performing arts, theatre, independent cinema, conferencing as well as a café and restaurant. Across the road in the former GWR Carriage Works on London Street – the home of a new museum and art gallery. The street frontage could become a new Museum of Swindon and the extensive sheds behind an impressive and inspiring space for the modern art collection. So would the Carriage Works be viable? Yes. Such former industrial spaces are popular and provide large, adaptable spaces for collections. David Hockney himself paints in such a shed in Yorkshire and Bristol’s recent new museum is housed in very similar surroundings. Swindon deserves – retail at the Outlet; community, culture and performance at the Mechanics’; heritage visitor attractions including the much need boost STEAM needs; art and local history; independent restaurants and cafés, places to meet; leisure facilities in the beautiful Health Hydro; green spaces to walk and play within the GWR Park…… the list goes on…. Swindon is a town where people used to decide which local needs should be met, and in what priority. That’s what the Mechanics’ Institution, the Health Hydro, the former hospital in Emlyn Square all represent, just by standing there; the film ‘Railway Town’ proved this point recently. All our derelict jewels need to be restored and functioning in the interests of local people, and welcoming to visitors too. Let’s think ambitiously, and in a joined-up fashion to get the best we can for Swindon in the spirit of those who left us such a legacy. And what about that gaping hole in the town centre? I’m sure plenty of developers in the current market would be keen on a town centre site for housing, say mid- rise apartments, providing a very welcome financial boost to the Council and provide more shoppers for the retail area. This alternative vision is essentially everything nearly all of us have always wished Swindon could achieve culturally.